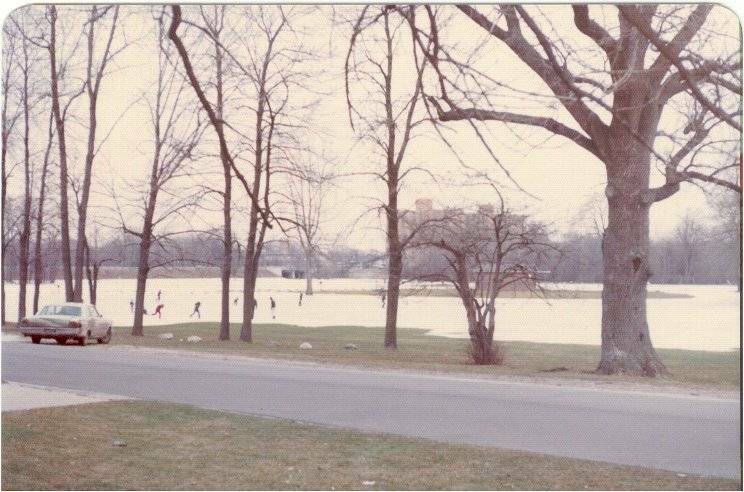 My brother Greg Schneider took this picture standing on our front lawn at 1387 Colonial Drive, Inkster Michigan, looking at the frozen flooded park across the street as people skate on the pond with joy. The Inkster Twin Towers (a senior citizen retirement center) are visible in the distance, as is the bridge on Inkster Road where the Rouge River crosses underneath. This shows the extent the overflowing of the river affected the park flooding it almost completely.